I've started, acquired, inherited, sold and bankrupted businesses -- below is some of my story. I’m a lucky man! My dad (who went by “Robert” or “Bob” Kelly) taught me early on to love business. 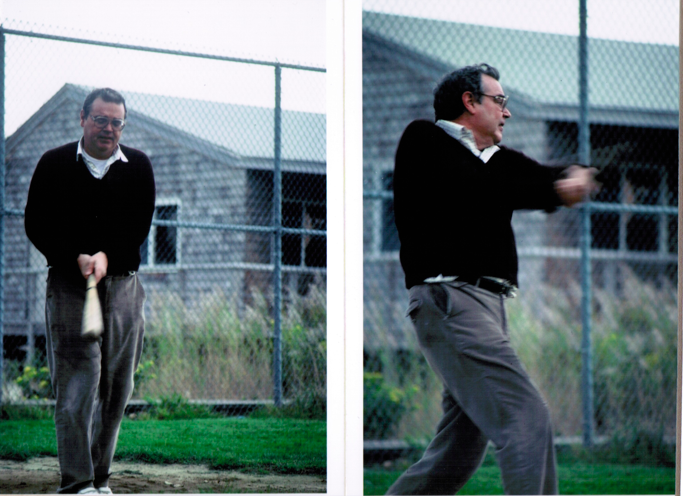 Dad (pictured below) studied business at Columbia University in the 1950’s under the legendary securities analyst Benjamin Graham (who had taught another legend, Warren Buffett, just a few years earlier). Ben Graham’s nephew Richard Graham and his wife Susan helped my parents find the Manhattan apartment I was raised in. Think long-term — -dad invested in some companies whose stock price didn’t change for 10 years (that was contrarian back in the ’80s and still is now!). My dad (Bob Kelly) said that business is like baseball: you can sit back and wait for the right pitch..though unlike baseball in business you can wait a lot longer for that "meatball" pitch. Dad illustrated one Buffett philosophy – “always meet the people you do business with face to face” — when I was 16 years old. He asked me to attend the shareholders meeting of McIntosh Laboratories, the Binghampton, NY-based maker of high-end electronic equipment used by bands such as the Grateful Dead and high-end audiophiles. I was eager for this McIntosh roadtrip: a 3 and ½ hour drive for me and my new drivers license. The shareholders meeting was uneventful but through curiousity, and likely misdirection, I suddenly found myself sitting in on the McIntosh board meeting where I attempted to vote yay and nay on a few board matters before an elderly board member explained that my vote didn’t count. The teachings of Warren Buffett would later lead me to study Charlie Munger, Buffett’s close friend and business partner (and an amazing teacher!). I loved business so much as a kid that by the time I graduated high school I was ready to work on Wall Street full time – dad’s colleague John “Wall Street” Walsh talked me into attending University instead: “Wall Street will always be here, kid,” he wisely told me. My dad later died of pancreatic cancer (something I’d love to help cure in my lifetime!) on March 12th, 2000. Writing a “Wall Street” column for Bridgeport’s Scribe newspaper. Surveying students on “The Most & Least Favorite Professors” (and publishing it in the Scribe newspaper in a popular – albeit controversial – year-end article). Finding a part-time job at New Science Associates, a management consultancy (spun out of, and later sold back to, Gartner Group). My junior role at New Science (was eye-opening: I got to assist their analysts – including Ken Sonenclar, Bruce Barlag, Jerry Michalski, John Popolizio, and Bill Martorelli – in studying the business implications of advanced technologies such as neural networks, expert systems, C.A.S.E. and image processing for such blue-chip companies as American Express and McDonald’s. From there I joined Digital Information Group (DIG) – led by the sharp husband and wife team Jeff Silverstein (amazing at analytics) and Maureen Fleming (awesome marketer) along with Chris Elwell (folksy manager). 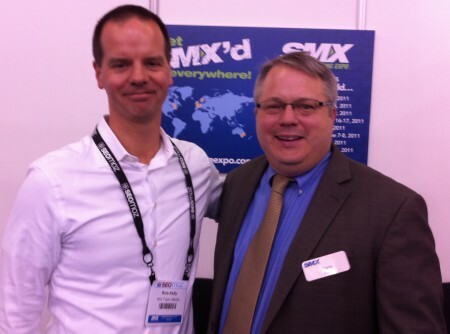 I get to see Chris E. at some of his terrific conferences like SMX in 2011 -- horrible lighting, I know. We published the Software Industry Bulletin (for software executives) and Information Industry Bulletin (for publishers of online services, textbooks, encyclopedias and CD-ROMs.). Bill Campbell of Claris and Go Corp.
Fred Gibbons of Software Publishing Corp.
How could I not catch the Tech bug after that experience! I next joined CMP Media, a publisher of such killer tech trade magazines such as Computer Reseller News (CRN) and Information Week Magazine. CMP was founded by Gerry & Lilo Leeds and they had instilled strong values — day care, tutoring for local highschoolers, embracing of women in the workplace — into their family-funded business…and their son Michael was now at the helm. 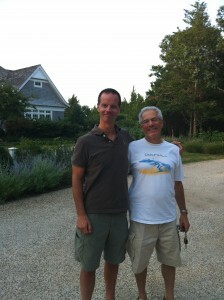 Michael would end up a key inspiration in my career…and someone I’m proud to now call a friend (he’s pictured to my right in 2010 photo out on Long Island). 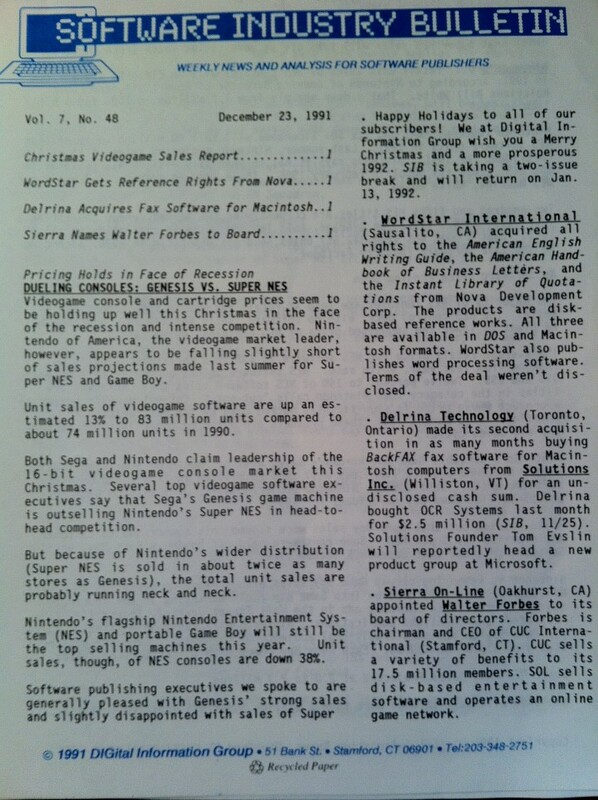 My first job at CMP was a reporter for Information Week, a leading magazine for chief information officers. Interviewing Bill Gates (with fellow reporter John Soat) and Microsoft’s executive team at Microsoft’s offices (I ended up getting to see Bill Gates on a few occasions including eating a hamburger in the Seattle Airport, and when I ambushed him backstage at the Moscone Center in San Francisco to interview him on a Windows launch). Getting a surprise phone call from Steve Jobs one evening (Jobs was in between his Apple stints and agreed to talk to me about his Next Computer business). Having former Microsoft CEO (and now LA Clippers owner) Steve Ballmer visit our low-budget office at 88 Kearny Street in San Francisco (he arrived at 830am and asked for the only beverage we didn’t have prepared (Diet Coke). I recall sitting down with Sun Microsystems CEO Scott McNealy before his COMDEX keynote speech in the early ’90s talking about his love of playing hockey. The technology business leaders I was meeting in my journalistic role began to inspire me to want to create business rather than write about it – I no longer wanted to be a spectator. I lobbied for a new business role at CMP and ended up with Ellen Pearlman & others on the founding team of Home PC Magazine, the first major magazine focused purely on people using their computer at home. Interviewing Julia Childs for a story on cooking software: I cold-called Julia by calling Information for Cambridge, Massachusetts – and she answered the phone! Creating a new magazine was fun – and we reached 500,000 readers — but after its startup phase, Home PC needed me to write full-time…I was more interested in creating new business (truth be told: I wasn’t that good of a writer!). Around this time, CMP had a new team led by Jerry Colonna (and later Mitch York) exploring this new thing called “The World Wide Web.” Our techie readers were telling us this thing could be big and CMP’s small team began a Web site called TechWeb. TechWeb sold the second banner ad on the Web (to IBM), which I believe is the second monetization of the Web (Wired Magazine’s Web team sold the first online ad). My manager Mike Leeds encouraged me to join that team to work on business development. My charter at first was to grow our content syndication business (we had 1 million articles that we licensed to electronic information services such as Lexis Nexus and Dow Jones). I was proud that CMPnet/TechWeb was at one point a Top-10 revenue-producing Web property. CMP went public in 1997 and had gotten quite big: $473.9M in revenues that year (CMP would be acquired by United News & Media for $920 million in 1999). 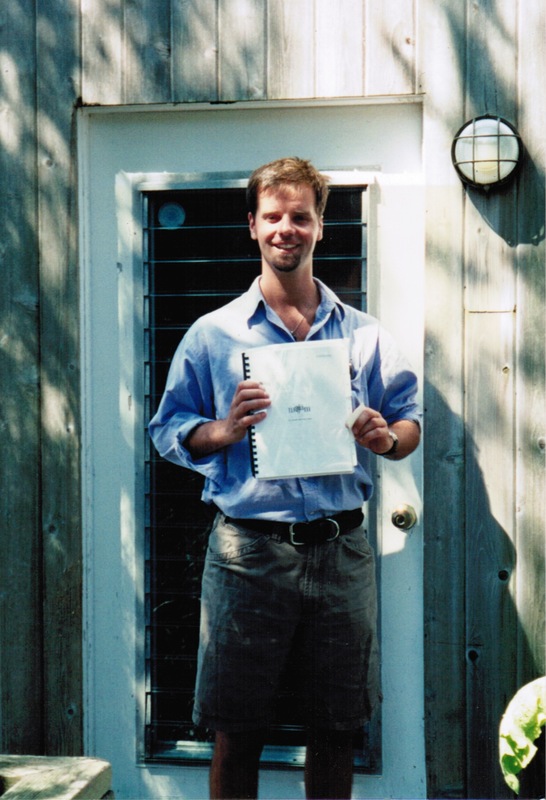 By 1998, I was so excited about the Web that I decided to go off on my own and build a business from scratch. CMP’s CEO Mike Leeds was gracious upon my exit, telling me he’d like to be my first investor. I chose the music space, found a co-founder in Chris Dobosz, and Mojam was born. That's me holding the first business plan I had written for a real business. However, I was naive as an entrepreneur; especially when we expanded our mission to be an incubator and launched two additional businesses (Purchase.com and Express Doctors) with a very small team. We had bitten off more than we could chew: Purchase.com was a non-starter and Express Doctors was a major failure (losing a Series A Round of financing). And the Internet bubble was bursting around this time (2001) — I had to take a time-out from my own startup to make some income. I discovered an email marketing company called Topica founded by serial entrepreneur Ariel Poler where I got to lead the effort of building a new product. I was laid off from Topica in 2003 and went to recharge my batteries in New Zealand – where I skydived, swam with dolphins and learned organic farming as a WWOOFer – and in the Virgin Islands where I learned to scuba and watched a friend get married. But all was not lost. Mojam was still alive. While Purchase.com & Express Doctors were false-starters, we did have a win in turning Mojam into a profitable small business based on a content syndication model. We ended up selling it to Wolfgang’s Vault — a neat San Francisco company that acquired much of Bill Graham’s recordings and merchandise — in 2007. 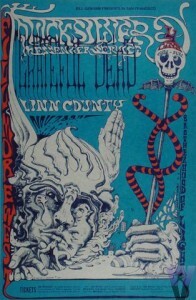 Receiving a Grateful Dead poster as old as I am as a bonus for selling a business is just plain cool! Wolfgang’s senior team of Bill Sagan and Eric Johnson were great guys to sell a business to (they gave me the 1967 Grateful Dead poster above as a signing bonus — now that’s my kinda business partner!). And Mojam still lives on as a brand and service! 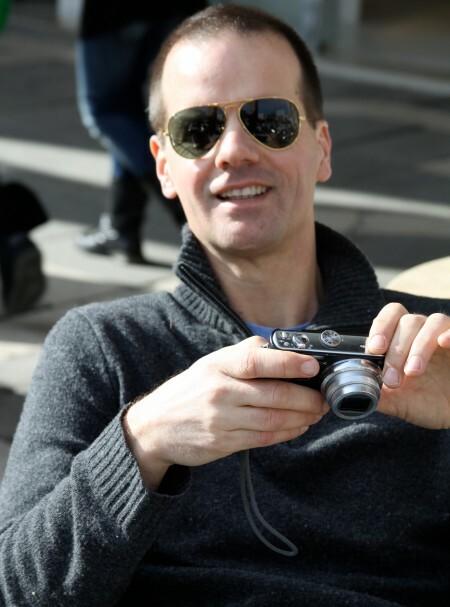 Back to 2004…by the time I returned from New Zealand I had a few messages from an old CMP colleague Drew Kossoff who was working at Double Your Dating (aka DYD), a business founded by Eben Pagan that helped men become more successful at dating. Eben (kneeling, far right in pic below) was the guru behind DYD (he used the stage named David DeAngelo) and Eben and Drew offered me a contract position helping them grow the Double Your Dating business that quickly turned into a full-time sales and marketing role. I always got a kick out of the fact that both Eben and I were single (women didn’t seem to appreciate the irony). 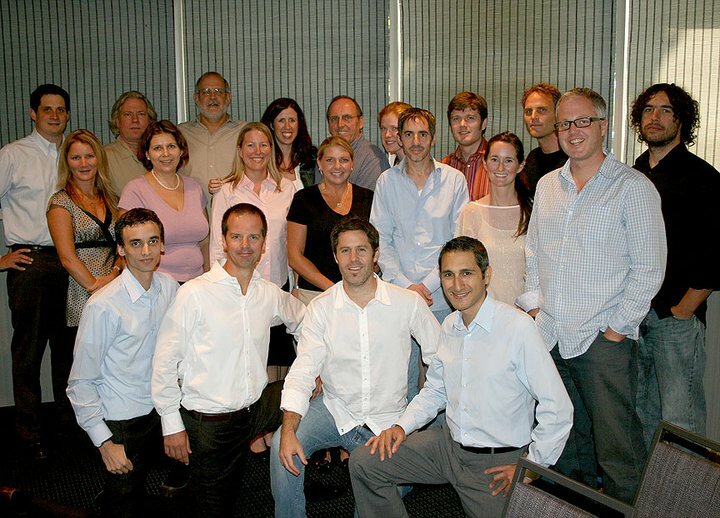 Our team did indeed launch additional brands, rebranded our parent company to Hot Topic Media and before I knew it Eben offered me the CEO position, working closely with a wise CFO named Ralph Clark (top row/fifth from left in pic above) who had worked at Coca Cola and Knott’s Berry Farm (which he helped sell to Conagra). I’m very proud of the team’s work over the years as Hot Topic Media. By the time I left in 2010, we had sold over $100 million worth of dating advice e-books and audio/video programs (all marketing via the Web), with no venture capital and were profitable. I’m very proud of the strong values the team exhibited during some tough times and remain close with Eben and many others on the team. I Love Coaching Leaders Smarter Than Me! Throughout my journey I’ve been real lucky to get to coach some super-smart leaders out there. Here is a list of some companies I’ve advised. Truth be told: I often learn more from them than they they have from me. In 2010, I was getting that itch to get my hands dirty again, to build something from scratch. Eben agreed to let me switch my role from CEO to Advisor (see the companies I advise) to free up time to help build some new Internet businesses. 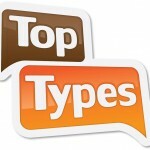 I wanted to understand how Google and other search engines work better, so one project I tested was to blog about personality types (like Myers Briggs, Enneagram, etc) and that culminated in a side-project called TopTypes, a Web site that tells you what careers and famous people are associated with your personality type. I also became very interested in online hiring after having met hiring guru Brad Smart (author of Topgrading) back in 2005; and also noticing that there had been very little innovation in how jobs are marketed online since the 1990′s (when Monster, DICE and job boards entered the scene). That led me to start Ongig, a Web site that is on a mission to make all job descriptions awesome. I was lucky to talk recruiting star Jason Webster and engineering magician Kevin Lanik into joining me as co-founders. 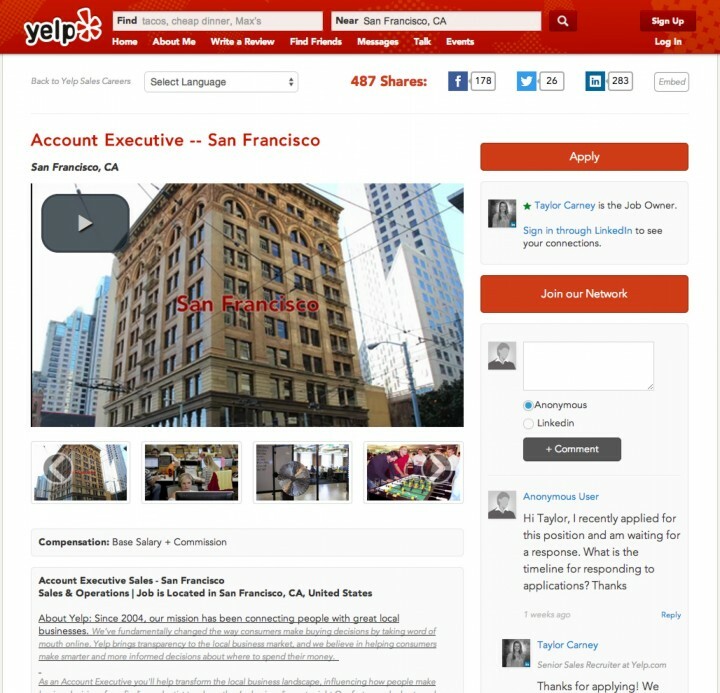 Below is an example of Ongig’s first invention: an interactive job description (this one is built for Yelp and is the most socially-shared job in the world). Ongig now has an Employer Branding SaaS that we sell to enterprise clients who want interactive job descriptions at scale. Early clients include Yelp, American Express, Autodesk, CDK Global (an ADP spin-off) and Intel. As my nephew Miles and niece Ruby were coming of age, I had a yearning to share my life-lessons with them — I know, it’s a bit self-important, but it feels purposeful for me to share things that I think can make the world a better place. I so enjoyed the process of writing the book (which I also gave away freely to friends, family and new people I’d meet), that I decided to officially publish it. I’d be honored if you checked it out on Amazon.com — it’s called An Enlightened Entrepreneur: 57 Meditations On Kicking @$$ In Business & Life. Thanks for reading a bit about me. Feel free to ping me (through the “Contact” tab) for purposeful projects. I’ll do my best to reply.